Back in the 1980’s, I was a ballet dancer who went off to Africa. I could have used a guide. But I was young and didn’t even give the concept — ballet dancer + Africa = not — much thought. For the previous five years, ballet had been my world, even as I concurrently earned my college degree and worked. English teacher in the Peace Corps seemed to be a fun role to audition for. So I tried out, got cast, moved to Central Africa for two years. During which time I came to realize that classical ballet and provincial Africa don’t particularly mix and that I was a fish out of water. Cut to present day, where I just recently completed my rewrite of “that Africa novel,” now in its third incarnation. If you’re one of my earlier readers, you might remember reading this post, and you’ll know the original 2002 novel was titled Black Ivory Soul. During the past six months as I rewrote, the working title became The Art of Foreign Relations. Last week, however, I pitched titles to a group of writer buddies, and they pointed out potential flaws to my shortlist (favored by me was A Ballet Dancer’s Guide to African Survival, which even I knew was too damned long). The trimmed title that resulted from the group brainstorm is A Dancer’s Guide to Africa, and does just what it’s supposed to do. Because, invariably, my elevator pitch for the project starts off with, “So, it’s about this ballet dancer who runs off to Africa to escape her problems…” No, the novel is not autobiographical. Well. Maybe a teensy bit. But I digress. That guide I could have used? While it doesn’t seem to exist, here are a few of my personal impressions. And bear in mind the impressions date back thirty years. Also, I’m not counting South Africa here. It does have its dance companies, choreographers, ballet dancers. I am thinking of Central and West Africa. If you have more recent information to share, or information about other parts of Africa, my readers and I would LOVE it if you added what you know below, in comments. Reconsider bringing your pointe shoes. They just go mushy fast in the humid, warm climate. Give your poor feet a well-deserved rest. Don’t make any assumptions about the availability of a studio, a class, a space to do ballet. Expect kids to hear your music and come running, and watch whenever possible. This classical ballet stuff is fascinating for them. Ballet means something different in French-speaking Africa. The French word for what I call “ballet” is la danse classique. On the other hand, Les Ballets Africains is a dance company based in Conakry, Guinea, one that promotes traditional dance and culture of Africa. Dance is something so innate in the African culture, it’s a difficult concept for Africans to consider, the way Westerners compartmentalize dance, into something a young girl might do once a week, in a studio, paying for lessons, and no more. It baffles them to consider that some people prefer not to dance at all. 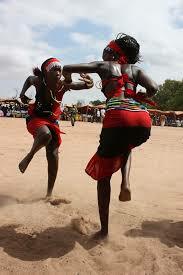 In A Dancer’s Guide to Africa, my character, Fiona, muses about dance and its place in Africa. Here’s an excerpt, where she’s talking with Christophe, her Gabonese friend (and so much more, but let’s not get into that angle here). And lest you feel annoyed with Fiona for clinging to her “I only do ballet” attitude toward dance in Africa, know that her metamorphosis from “ballet only” to embracing African dance is part of the story. A big part. I waded out into the Atlantic, diving through the breakers. The undertow tugged at me as I sliced through the warm water, stretching my muscles, freeing my body. It felt glorious – the closest thing to dance I’d found in a long time. I swam back and forth for twenty minutes, releasing the surplus dancer energy I’d carried for weeks. Months. Finally I made my way back to shore and the chairs, dripping, chest still heaving. “That was quite a workout,” Christophe said as I collapsed in the seat next to him. “It’s what I excel at. I’m not comfortable doing the other styles.” I watched the ocean thunder onto the beach and whisper its retreat. “Have you tried?” he asked. Dance, I’d come to see, was everywhere here. 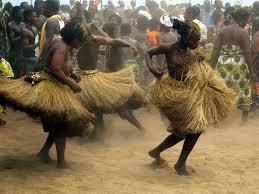 The Gabonese danced at clubs, bars, parties. They danced in church; they danced in rituals; they danced to honor the arrivals of politicians and luminaries. 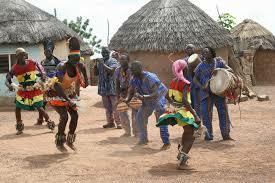 They danced any time someone put on the right music, which meant, any music with a drum beat. Or any beat. One thing they didn’t dance to was classical music. I hadn’t heard a whisper of anything classical, aside from my cassettes—stolen in theft number six—since my arrival in Africa. “And how was it?” Christophe prodded. And I didn’t need Christophe to inform me why, that something in me was too rigid and had to loosen, not just physically but psychologically. I knew this. I’d watch the Gabonese move with a freedom within their bodies that I couldn’t even imagine. Relaxed energy flowed from all parts of their body: the legs, the torso, the arms. Sometimes the movement would be so small, just this gentle, rhythmic shifting from one foot to another. There was an innate flexibility in their hips. When I saw toddlers learning to dance in tandem with learning to walk, I understood the source of the intuitive movement. Even before that, actually. Babies were tucked on their mother’s backs, tied in place with a spare pagne. Every movement the mother made, and she went right along with her business, the child felt. Jiggling, swerving, dancing, striding, straining, from a child’s earliest kinetic memory. I thought of my own Omaha upbringing and my first exposure to dance at age eight, with Miss Claireen’s class. And even then, it had been once a week, only in later years three and four times weekly. Less than six hours a week, through my adolescence. Ballet alone. Which I loved fiercely. No ballet available here? Fine. No dance, I told myself. Christophe studied my stubborn expression. He shook his head and, to my irritation, began to chuckle. Got questions related to Africa and/or trying to maintain a private dance practice there? Drop me a line! And be on the lookout, in October 2018, for A Dancer’s Guide to Africa. It’s a great yarn, with plenty of humor and heart. And heaps of Africa. Want to see some great African dance? This is a YouTube of Umoja, a 2011 collaboration that brought together three artist groups in the West African tradition – Voice of Culture, Duniya Drum and Dance, and Oyin Dance. The event was held at Caponi Art Park in Eagan, MN. I love that there’s a Caucasian dancer in the mix. She rocks. It makes me think of my character, Fiona, once she’s evolved. This entry was posted in Ballet, Life, The Writing Life and tagged a ballet dancer's guide to Africa, author Terez Mertes Rose, ballet dancing and Africa, Dance in Africa, dance in Gabon, dancing as a child in Africa, Duniya Drum and Dance, fiction about Peace Corps, fiction about the African experience, novel called A Dancer's Guide to Africa, novels about dancers, Novels by dancers, Oyin Dance, Peace Corps in Gabon, Voice of Culture, why do Africans dance so well on December 5, 2017 by admin.